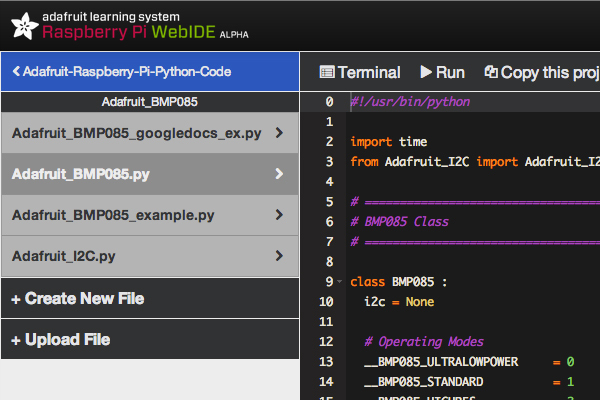 The Adafruit Learning System Raspberry Pi WebIDE is Ready for Testing #piday #raspberrypi @Raspberry_Pi « Adafruit Industries – Makers, hackers, artists, designers and engineers! We finally have the Raspberry Pi WebIDE in a place where we think it is solid enough for an alpha release. First, a disclaimer: this release will likely have bugs, and minor issues, so we recommend that only experienced linux/python users install it for the time being. It is certainly our intention to get this solid and ready for all users, and we will let everyone know when we think it is at that point. Now, onto the good stuff. The quickest way to get up and running is to head on over to learn.adafruit.com/webide and follow the installation and setup instructions written there. As you can see, we are closely tied to Bitbucket, and any code changes you make will be synced to your Bitbucket account. We chose Bitbucket over Github because they offer free secure accounts, which we thought was very important for the WebIDE. If you have a very active bitbucket account, you may want to create a separate one for this test, as this is an alpha, and may have unforeseen issues. So, first go to learn.adafruit.com/webide to learn how to install and use the WebIDE. Then, please tell us what you think. Still not sure what the Raspberry Pi WebIDE does? Click here for a long list of it’s many features. If you find any bugs, please submit an issue on Github. Looks great! Can’t wait to try it – have to get a Pi first though. Will be downloading and installing today! Can’t wait!